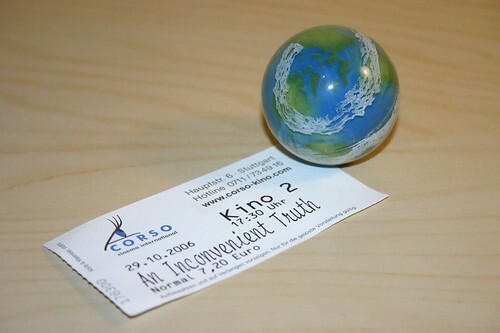 I went to watch An Inconvenient Truth with my flatmate this afternoon. Much of it is a very pesonal look at climate change by Al Gore and how he's been involved over the years, but I have to say that it does give a pretty good introduction to the topic of global warming and climate change, tying together different topics to show clearly how they're related. One thing I found a bit weird was that through the movie, as he's driving and flying all over the place - ever expanding his own carbon footprint - he doesn't say anything about how individuals can reduce their own emissions. A list of suggestions does come at the end though, perhaps in an attempt to help people remember them and think about what they can do when they get home from the cinema. All in all, I'd definately recommend going to see the movie or watching the DVD to help give you the global picture. Living in London, originally from the Isle of Man, I'm interested in all things geographic and enjoy photography. I am currently working freelance as a geo & web developer at Geobits, focusing largely on Drupal projects but also keen to take on projects involving mapping or having a geographic focus. Site design and contents © Dan Karran (unless author is indicated), copying is not allowed without explicit permission. Built using Drupal.